Here are some of the artworks I have in progress. In some cases, this glass (that is the neon light bit) has been ready for well over 3 years (so not sure how "coming soon" they actually are...) but I haven't yet finished the background for them. It usually takes me between 6 months and 3 years to write the background text how I want it, including the words themselves, the layout, images etc. All are copyright Rebecca Mason Art. I always post the neon light glass (forming my work in progress) as soon as it is done - usually this is on my instagram page, which acts as a date stamp for copyright purposes re when my neon words were created (even if it then takes me a few years to finish the background they will sit on). 2017. Background to this one is also pending. 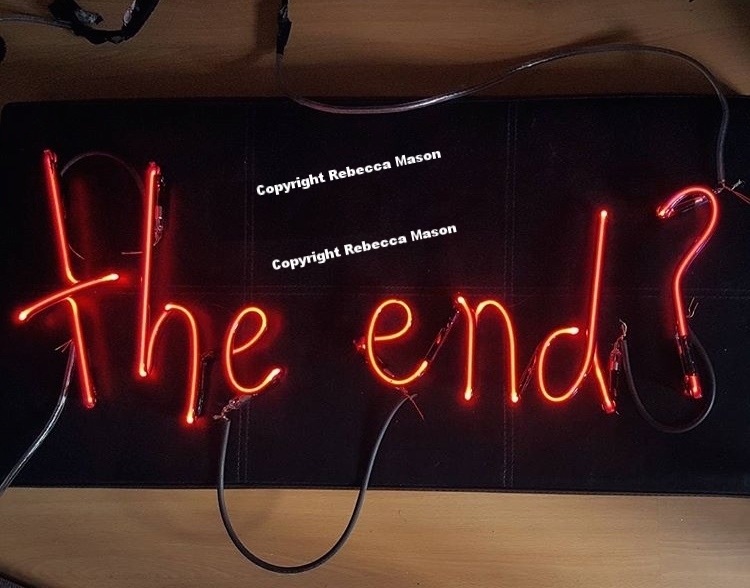 The neon will sit on top of an acrylic or aluminium background with an image/text underneah. concept devised 2018. Will occur March 2019. "I am" forming part of a piece with a background of text about existence. Copyright. 2018. WIP. Background pending.